Are We There Yet? Never! Whether our journey is geographical, emotional, or spiritual those seem to be underlying questions. We want to “arrive” – with all the various meanings of that word. We want to arrive safely at the end of a geographical journey. We want to arrive in our career with success and recognition. We want to arrive emotionally in the sense of being complete, whole, and satisfied. “To arrive” is somehow seen as having been successful, accomplished, known. Many of us not only want but often strive to arrive spiritually. Arrival is not, however, the destination of the spiritual journey. Are we there yet? No. How much longer? Eternity. When will get there? Never. The answers on the spiritual journey are different. The spiritual journey is one of eternal progress towards God. This is sometimes called the doctrine of epektasis and attributed to St. Gregory of Nyssa. And so every desire for the Beautiful which draws us on in this ascent is intensified by the soul’s very progress towards it. And this is the real meaning of seeing God: never to have this desire satisfied. But fixing our eyes on those things which help us to see, we must ever keep alive in us the desire to see more and more. And so no limit can be set to our progress towards God: first of all, because no limitation can be put on upon the Beautiful, and secondly because the increase in our desire for the Beautiful cannot be stopped by any sense of satisfaction. St. Paul describes his own journey as one of stretching and straining forward [epekteinomenos] toward the goal for the prize of the upward call of God in Christ Jesus (Philippians 3:13-14). Paul is describing a constant move forward in an attempt to grasp something. For Gregory this movement describes the soul’s eternal progress in grace and perfection in God. Our longing for God is fulfilled in our progress towards God but is never satisfied. The grace of an unsatisfied soul calls us forward, deeper into the heart of God. I cannot help but wonder if that “grace of unsatisfaction” is not God’s own longing for us. 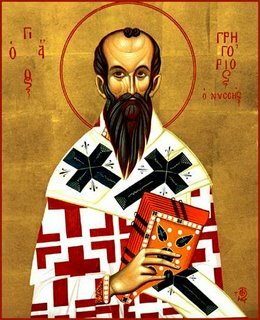 In the Episcopal Church today, March 9, is the Feast of St. Gregory of Nyssa. The Eastern Church celebrates Gregory on January 10. May the mercy of God and the prayers of Blessed Gregory and all the saints grant us the grace of an unsatisfied soul, the strength and will to strain forward, and the courage to trust the Mystery. * This is a re-post from last year. For all my talk about journey, what I really want is to have arrived. Jon Mark, I am right there with you. For me (and, I think, many others)part of it is about being “enough.” I still find myself at the end of some days adding up my billable hours. I love the concept of epektasis. In fact, I can’t get enough of it! Lucky for you there is always more! Now that you are a proud owner of the Anglican Breviary, you can enjoy the spiritual blessings of the ‘Itinerarium’. I think we are there, its just our souls, our minds, our bodies aren’t aware of it. We have so much conscious programming created by society that it creates blockages that do not allow ourselves to see it. Angel, thanks for your comment. It reminds me of Jesus’ exhortation to stay awake. We fall asleep and miss what is before us. nun Helen, that is a beautiful reflection and description of the journey. Thank you. I will remember you in my prayers.